I need to share with the world the most sentimental, yet special, social media birthday shout out my best friend gave me two days ago. This chick is not only my sorority "big" sister, but she's my walking diary, mentor, and the reason The Beetique exists. Melody The Millennial starts off by saying, "It’s that time of year again. Your BFF’s birthday has arrived and you’re thinking of a million ways to make her feel like Kim Kardashian. The Instagram Pic Stitch, the sentimental Facebook novel, and now even the personalized Snapchat story all take you on a trip down memory lane", which is hilariously true. The clock strikes midnight the night of your birthday. You wait for the 12:00 on-the-dot happy birthday texts & calls, to see who the truest friends are that'll Instagram you, the Twitter mentions to pour in, followed by the 300 people that write on your Facebook wall. But when you're on the other end - the best friend completely driven to come up with the best social media birthday shout out to blow everyone else's out of the water, AKA my big, you create a blog post. 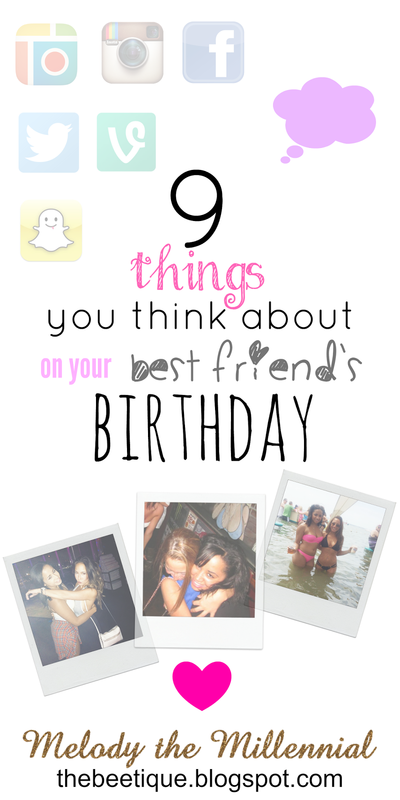 And just when you're thinking of the perfect memory to shine on, she instead shares the most relatable 9 Things You Think About On Your Best Friend's Birthday. 2 comments on "9 Things You Think About On Your Best Friend's Birthday"